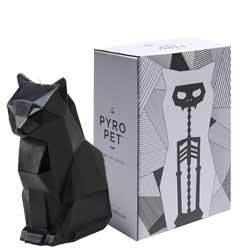 The Pyropet range of candles is growing all the time, the latest addition is Kisa, a black version of the popular cat range. It's quite a large and chunky candle: 6.7 x 2.9 x 4.5 inches (17 x 7.5 x 11.5 cm) with a burn time of around 20 hours. However, I really had a problem burning this - I didn't want to. This is one of those novelty candles where you really don't want to see it melt. However, it's in the melting that this candle's unique properties lie, for inside every PyroPet candle is a metal skeleton waiting to be exposed. A little creepy, but very imaginative and a great talking point at parties, especially at this time of year with Halloween fast approaching. The company recommend placing the candle on a plate with a minimum diameter of 10 inches (25 cm) to contain the wax as it melts. It's a great novelty gift for that cat lover in your life. It's just a shame you have to burn it to get the full effect. Dimensions: 6.7 x 2.9 x 4.5 inches (17 x 7.5 x 11.5 cm). 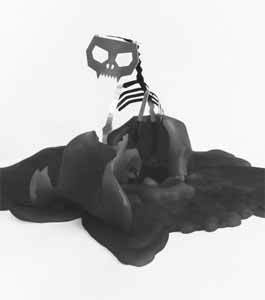 Materials: Made from paraffin wax, cotton wick and aluminium skeleton.